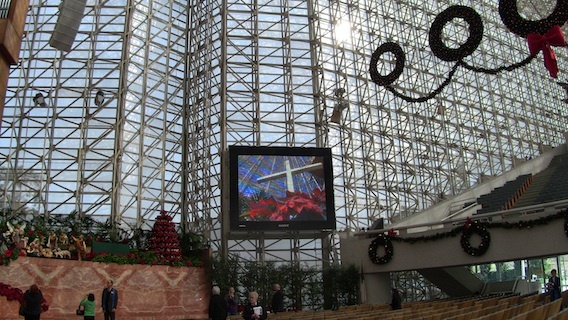 The Crystal Cathedral is considered by many to be the original mega church. Founded by Robert H. Schuller and his wife, Arvella, the church has grown from space rented from the Orange Drive-In Theatre into one of the most impressive all glass buildings in the world. 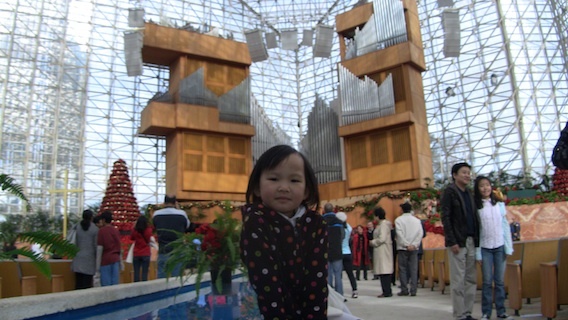 Construction on the Crystal Cathedral began in 1977 and was completed in 1980, built at a cost of $18 million. Expansion continued unbated for the next two decades. In 1990 the Prayer Spire was completed. The Family Life Center was also added in 1990 and in 2003, the church campus was completed with the opening of the Richard Meier-designed Welcoming Center. The main sanctuary building, which was constructed using over 10,000 rectangular panes of glass, seats 2,736 people. The rectangular panes of glass are not bolted to the structure; instead they are glued to it using a silicone-based glue. This and other measures are intended to allow the building to withstand an earthquake of magnitude 8.0. 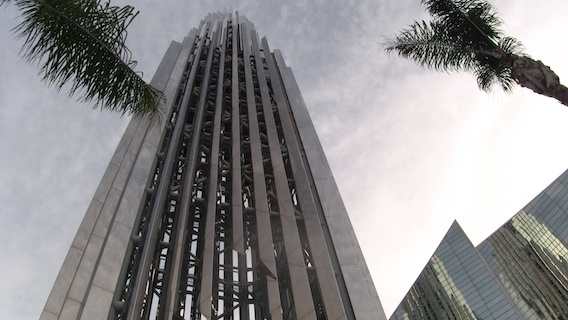 During its hay days, the Crystal Cathedral would fill every single one of its 2,736 seats for all its services and its Hour of Power broadcast was the most-watched Christian program worldwide, with an estimated average of 20 million viewers tuning in each week. 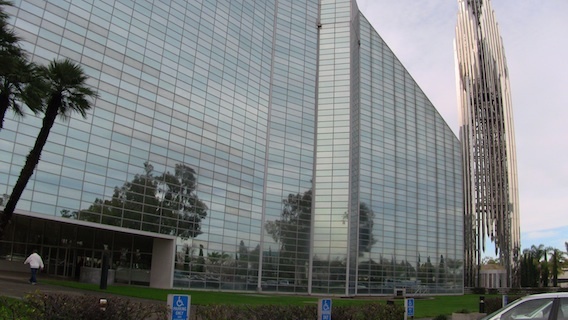 Today, the Crystal Cathedral serves as an example on how not to do a family succession. The Cathedral filed for bankruptcy protection two months ago, citing debts of nearly $55 million. A spokesman for the church said the recession had greatly affected its operation and donation levels. However, the Cathedral’s problems started long before the recession kicked in. Siblings struggling for control plus a founder’s unwillingness to give up control resulted in a lost of focus, an inability to keep and attract new followers and evaporating TV ratings. 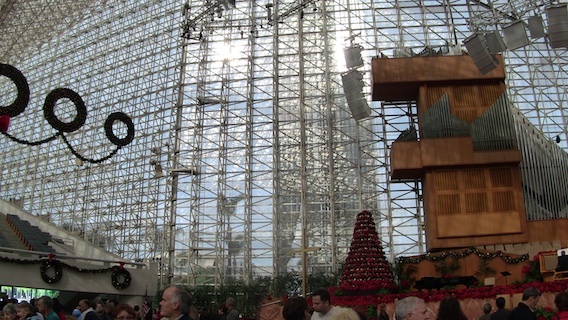 When we visited the Crystal Cathedral for Sunday service, it was like a ghost town. I estimated attendance at around 500, which is great for a normal church but in a church the size of the Crystal Cathedral, the place looked dead. I really hope the Crystal Cathedral will be able to turn things around. With its current weekly attendance level, the Crystal Cathedral qualifies as a mega church in building size only. 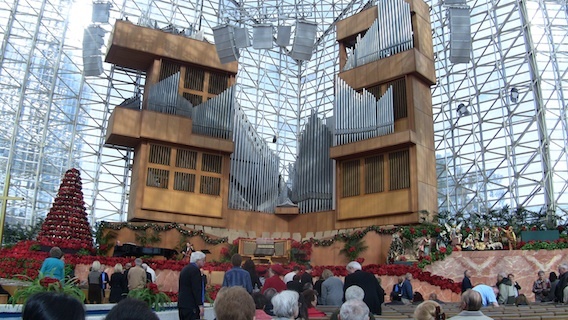 Whether you’re a Christian or not, you should check out the Crystal Cathedral if you’re ever in the Orange Country area. It just might give you a religious experience.